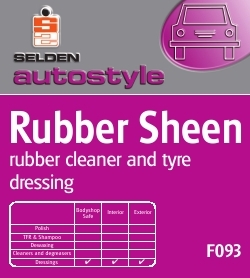 A versatile, easy to apply cleaner/dressing for use on all rubber trim including floor mats, weather stripping and pedal treads. Ready to use Cloth application: Ideal for even surfaces. Apply using a lint free cloth. Apply an even continuous wet film which will quickly dry to a sheen finish. Brush or trigger spray: For speed and ease, particularly on uneven/rough surfaces. e.g. tyres, mats. Apply evenly and allow to dry.